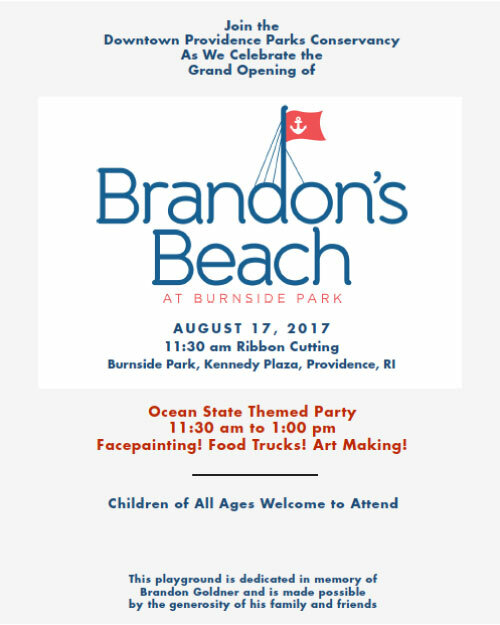 Brandon’s Beach at Burnside Park opens on August 17! Join us on Thursday, August 17 for the ribbon cutting and grand opening of Providence’s newest playground, Brandon’s Beach at Burnside Park, a destination playground for children of all abilities located in the heart of Downtown Providence. The nautical theme of the playground, designed by Rhode Island native Tiffany Rodrigues for internationally renowned Kompan Play Equipment, was inspired by the Ocean State and Providence’s historic harbor, where large ships would dock in the Providence River. This one-of-a-kind, custom design features climbing structures unique to Burnside Park, and evokes the look of a marina, with nautically inspired poles and ropes. The playground is appropriate for toddlers and young children of all abilities, and offers a wide variety of sensory-rich equipment, including pagoda bells, drums, and music pipes. It also features classic swings, slides and spinners. This playground was built in memory of Brandon Goldner and made possible by the generosity of his family and friends. Come down early and join us for KidoInfo Storytime + Art in the Park. At Storytime we’ll have special guest Keith Munslow singing songs and getting everyone dancing. Art in the Park follows with an ocean themed craft to get ready to play in the new playground at 11:30! You won’t want to miss this very special Thursday. You can find all the details here. Please join us on opening day to play in your new park!